I wrote about my decision to run this here, but I’ll just summarise in saying that I never thought I’d run a marathon, even after running for nearly ten years at that point. But once the decision was made and my race entry paid, I’d realised that I’d need to follow a plan since I was well out of my depth. Luckily, I knew how ignorant I was, so I sought advice from pretty much everyone I knew that had run one, and they nearly all said to use Hal Higdon’s plans. After looking through the various plans (and deciding exactly how many times a week I was prepared to run!) I settled on his “Novice 2” plan and followed it religiously all summer long. I highly recommend it, whether you go for the free version on his site, or the more interactive app. It was my first marathon, and some of you may be thinking “oh, but she runs, I’m sure it was no problem for her”. Think again – that distance is no joke! I’d done all my training and got three 20 milers in, but it was still really tough. And up until 2012, I’d never raced farther than a 10km, so keep in mind that this is four times that distance! On the day itself, it was my absolute perfect running weather – cold, cloudy, and with a hint of drizzle, and I was nervous, but as ready as I’d ever be. I’d wanted to finish in under 4 hours, but my “gold medal” time was 3:45, and to achieve that I’d need to run at 5:20min/km throughout (that’s 8:35min/mi). So I started off at my “easy” pace, which ended up being 5:05min/km, and that felt good. I was a freaking machine, maintaining that up through about 28km, when it started to feel tough, and I slowed down considerably from 30-40km, just keeping the momentum going and counting down every single km marker. I had two cheering zones from my running crew on the course, but my GPS running app, Runmeter, lets my Dailymile and Twitter friends speak comments into my ear while I run, so I had cheers of encouragement from about 30 different friends from all around the world, including some who’d gotten up at 3:30am to cheer me on! I cannot stress enough how much this helped me to carry on during that stretch of 10km when it was a real struggle (and which I now recognise was the infamous “the Wall”). But at the 40km mark, we turned the corner out of Vondelpark, and I passed where I was staying and I knew it was only a short 2km to the finish, and that gave me the boost I needed to pick up the pace again, and – I’m still not sure where this came from – but I even managed a sprint finish into the Olympic stadium to finish in 3:48:23!! Which, umm, I’m stupidly happy with. At the time, I was even happier because my time meant I qualified for a Good for Age entry into London 2014, but which later the organisers changed without any warning, stripping me of my place. Anyway, I hobbled back to my running crew’s hospitality zone for recovery shakes and hugs, then back to where I was staying for an ice bath (my host brought me tea and chocolate truffles to make it easier! Bless! ), which I really think did help with my recovery. I had a few spots of chafing and two enormous blisters on my toes, all in brand-new places, but I was otherwise intact. Oh, and not only did I run a marathon, but I ran it in leggings I’d sewn myself, three years after I had a bone marrow transplant. 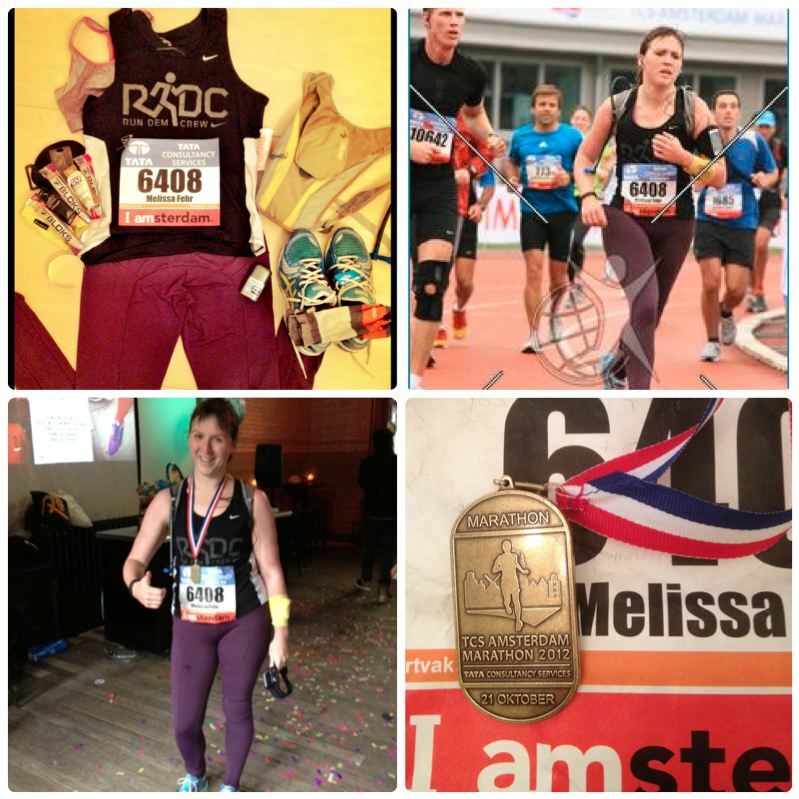 Amsterdam marathon, 21 October 2012, 3:48:23. You are so way faster than I’ll ever be, but reading about your approach and how you experienced the marathon is fascinating, such an amazing first marathon. I wished I’d known about these training plans before i started training for mine as it looks really good. I’m approaching mine ( a month away) and have completed my 22 miler and it had a tough final 5… I’m finding the observation of what you think and feel at different stages of such a long mental and physical challenge to be really interesting ( once I’ve stopped and am resting up, that is)! Mmmm…I was looking for something else when I hit this blog but I am really glad I did. Reading your experience actually inspired me and helped me in dealing with my anxiety! Especially because I, like you, have been running for years now but until not too long ago, my distances were not great.